Summer is the ideal time for the whole family to spend quality time together outside the house. Some families go to the beach and set up a camp fire. Others simply put up a tent in the backyard and watch the stars, or sleep there overnight. Whether you’re on the beach or in your backyard, you need to have a good quality tent for your family. Fortunately, there are hundreds of summer camping tents to choose from; some even have unique, fancy features that make the tent more comfortable and convenient. One important factor to consider when buying a tent is the seasonality. Tents may be 3 season (which are suitable for relatively temperate conditions of winter, fall, and spring), 3-4 season (which are the extended 3 season tents which are also suitable for summer use), and 4 season (which are very durable to withstand strong winds and heavy snow loads). If you are only going to camp during summer, it is ideal to have a summer camping tent. This will provide enough ventilation to keep the air freely flowing. This feature will keep you cool during the hot summer days and nights. It should have mesh and a rainfly to maintain ventilation, even when there’s light rain. One good summer tent is the Blue Ridge Family Outfitters Summer Camping Tent. It is ideal for the whole family because it has enough space to accommodate all members. The Blue Ridge Family Outfitters Summer Camping Tent is one of the best, and is a highly praised tent because of its unique and practical features. One of the most spacious tents on the market today, the Blue Ridge Family Outfitters Summer Camping Tent provides comfortable accommodation for 4 adult-sized campers. For a whole family comprising children, this space is enough. The two entry doors provide more convenient entry and exit to the tent. It also improves the ventilation of the inside of the tent; this ensures a cool stay inside it, even on hot days. While it says that it’s a summer camping tent, the Blue Ridge Family Outfitters Summer Camping Tent is made with water repellent 1500mm polyester to protect you from getting wet when raining. 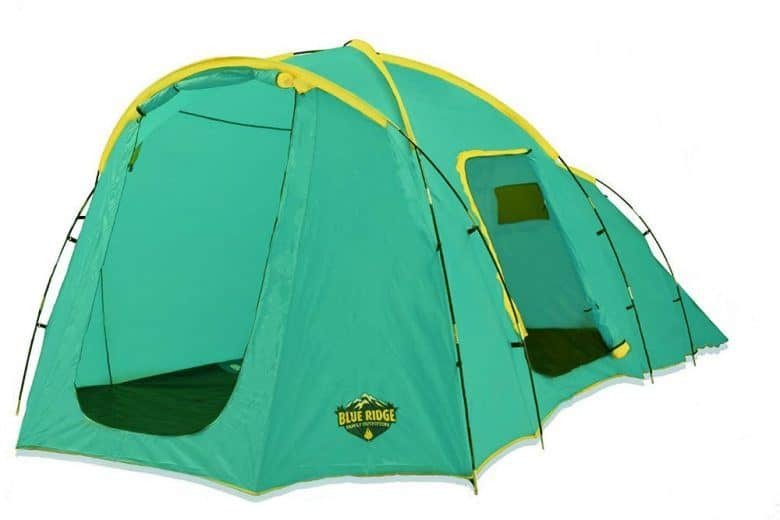 Aside from family bonding, this tent is also great for backpacking and hiking in the wilderness. It has a very compact and lightweight design which is suitable for travel. The entire package contains a carry bag, poles to give the tent structure, a removable fly for quick circulation of air, and stakes to kept it on the ground. The Blue Ridge Family Outfitters Summer Camping Tent has more advantages than drawbacks. Let’s look at its pros and cons to see if it is still a good summer camping tent despite its drawbacks. There are few drawbacks to the Blue Ridge Family Outfitters Summer Camping Tent, but some customers have felt that the Blue Ridge Family Outfitters Summer Camping Tent expensive. In fact, it is one of the more expensive tents on the market. If you are into summer camping, then this Blue Ridge Family Outfitters Summer Camping Tent is good for you. With it, you don’t need another tent to provide shelter for the whole family. With the Blue Ridge Family Outfitters Summer Camping Tent, every family member can be accommodated inside. It might be one of the more expensive tents available on the market, but it is also one of the larger tents offered. Aside from providing good air ventilation, it also keeps you dry during heavy rain because it is made of water-repellent material. No wonder many people like it and recommended it to others. Hey there, my name is Alex and I am the editor of this site. I have been a passionate camper and hiker for the past 10 years and my mission is to share my love and knowledge about those activities and how to prepare for them.